At an elevation of 9,700 feet, one thing that is instantly apparent is: It’s hard to breathe. Even walking from the chairlift to your car can completely take your breath away, which is one reason why the nonprofit organization Master-Link chose to host its annual Breath In music festival to benefit Cystic Fibrosis at Copper Mountain. Biviano said he hopes to elevate awareness about CF by not only bringing people to the High Country but also by combining two things that Coloradans love: skiing and live music. The 2010 Breathe In Festival will feature performances by The Pimps of Joytime, The Motet and Eliot Lipp, who will play at the base of the mountain in Burning Stones Plaza, and JWail with Octopus Nebula who will play at an after-party in the Copper Conference Center. Festival goers will receive admittance to the show and the after-party, a lift ticket, an event T-shirt and free beer from Coors for $84 – less than price of a Copper Mountain lift ticket. Thirty of those dollars will be donated to the Colorado chapter of the Cystic Fibrosis Foundation. For pass holders and those who already have a lift ticket, $30 covers everything, and 100 percent of the proceeds will benefit the CFF. Tickets for the after-party are $10. Biviano said he wanted to book bands that would appeal to the younger generation and span genres like funk, Afro-beat and electro-jazz. Bivian said that he wanted to show them that it doesn’t take a big checkbook to make a difference. “You can come out to a concert and go skiing and make a $30 donation and do a lot of good,” Biviano said, adding that the cost of the festival is also tax deductible. No only did Biviano want to bring in modern musicians that would appeal to the 20-something demographic, but also, he wanted artists that will make people move. “We wanted music that would make people get out and dance,” Biviano said. And these bands will certainly deliver. Eliot Lipp, who will headline the main festival, has been a heavy hitter in the electronic music scene for nearly five years. Lipp said he blends funk, hip-hop, electro and jazz to create his unique style of instrumental dance music. “For a long time, I studied early electronic music and different styles of funk and incorporated that into the music I made to create my signature style, electro-jazz.” Lipp said. While performing live, Lipp uses self-made samples and synthesizers to cranks out the tunes. “I have a MIDI controller for my software so that I can create live remixes; I also have a synthesizer so I can play live bass lines. I try to give myself as much as I can do with the one-man band thing.” Lipp said. 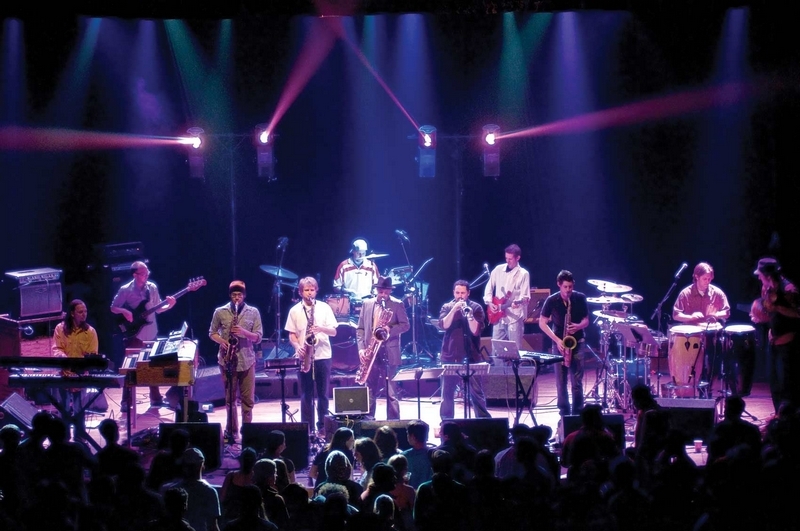 Before Lipp takes the stage, The Motet, a seven-piece out of Boulder, will bring its genre-bending style of Afro-beat, Latin and funk-infused dance music. The band’s latest album, “Dig Deep,” showcases its ability to flow between genres and even incorporate an electronic element while maintaining a high level of energy and dancability. The Motets drummer and band leader, Dave Watts explained that the band improvises and elaborates on their funky foundation, approaching live shows as a jazz artist would – though it can be a challenge with a band this large. The Motet has been playing around Colorado for nearly 10 years and has an ever-revolving cast of musicians. The current line-up includes percussionist Scott Mastersmith, Watts’ “favorite” bass player Garret Sayers, Dan Schwindt on guitar, two horn players – Gabe Mervine and Matt Pitts – and Joey Porter on keys. For fans that just can’t get enough, The Motet will also perform Saturday evening in Breckenridge at three20south. Kicking off the Breathe In festival is another band that defies categorization: The Pimps of Joytime. Hailing from Brooklyn, NY., this up-and-coming band combines funk, Latin and Afro-beat and wraps it up in a blanket of soul. Pimps guitarist and singer Brian J said that their hodge-podge style was influenced heavily by his own party going. Between The Pimps’ funky style and Brian J’s soulful falsetto vocals, it’s hard not to compare the band to Prince. Brian said he’s been told he even looks like him, but that Prince really wasn’t a direct influence. No matter the influence, fans can be certain of one thing: The Pimps will make you move. “We keep it fun and like to bring the heat,” Brian said. Whether donating for the cause or just coming for a live show, festival-goers will help fund Cystic Fibrosis research in Colorado. Biviano said that he wanted the festival to benefit a cause that would hit home, explaining that Colorado has an abnormally high occurrence of the disease. The disease has no cure, and the life expectancy for individuals living with CF is only around 30.